I haven't done any blatant self-promotion stuff in a while, so I figured I'd throw something up today when no one's really paying attention anyway because you're already thinking about your long holiday weekend. First, I'll start by pointing to the premier Fandomize podcast. It's going to be a show all about fans and fandom, and Cynthia Boris asked if she could interview for their first episode. We talk for an hour about fandom type stuff and I make an attempt to sound like I know what I'm talking about. Speaking of fandom, the latest installment of my Kleefeld's Fanthropology column went up on MTV Geek today. Every week, I write about fandom type stuff and I make an attempt to look like I know what I'm writing about. I'm also doing some more ad hoc type pieces for MTVG these days too. My two most recent are The Top 20 Webcomics BuzzFeed Forgot To Mention and Whatever Happened To 'Fantastic Four's' Cousin Bones? I might be doing some reporting on CAKE next month, too. I just submitted my latest Incidental Iconography colum for The Jack Kirby Collector #61, due out in late June. I look at one of Jack's later works -- The Eternals! I made a recent behind-the-scenes cameo in Greg Cravens' Hubris. If you read the next installment, you learn that I did indeed trade in the crap for a wagon. It's far from done yet, but I'm working on an essay for inclusion in a book entitled The Ages of the Avengers: Essays on the Earth’s Mightiest Heroes in Changing Times. My piece specifically will focus on Kurt Busiek's and Carlos Pacheo's Avengers Forever mini-series. 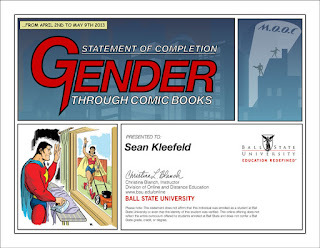 I recently completed Christina Blanch's Gender Through Comic Books online course. Fantastic material and discussions! I highly encourage everyone to take it if the opportunity comes up again! I've still got my The Comic Book Adventures of Harry Blackstone, Magician Detective book on hold while I sort out my permanent living arrangements. Unlike a lot of other research projects I work on, almost none of the material here is available online and the hard copies I have are currently in storage. I will get back to this sooner or later, though! And, as ever, there's my humble blog churning away in the background with no one but myself interested in it.